I just came across this great graphic on reddit which is attributed to the Intuition Ale Works brewery (at least the guy on reddit says that is where he first saw it). The diagram is based on John Palmer's Hop Wheel and was redesigned and updated by Tim Kreitz. I don't know either guy but I appreciate the effort. I've mostly put this here for our future reference just in case the imgur link that was on reddit dies. Interesting. 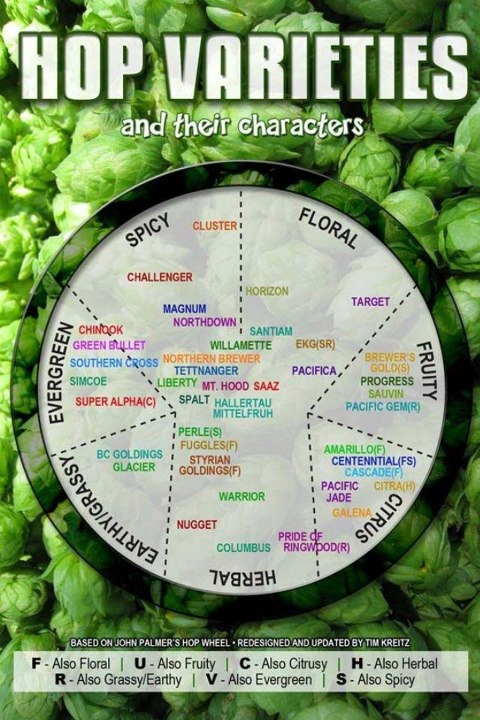 I wonder which ones are heritage hops versus modified genetic hops. I have no idea. I don't know if any of them are GMO hops.